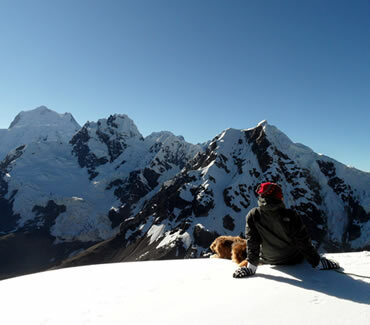 Munay Huayhuash, in the Quechua language means "the most desirable option", it’s called that because on this trek of just a few days you visit some of the most interesting places in the Cordillera Huayhuash and you climb a moderate level peak Diablo Mudo 5350 m / 17 552 ft, and ideal peak for amateur mountaineers; getting to the summit of this peak you see directly the west faces of the tallest mountains of the Cordillera Huayhuash; mountains like Yerupaja, the second highest in Peru. This route also affords spectacular views of lakes such as Jahuacocha and Solteracocha, it is rich in Andean flora and wildlife, offers many photographic opportunities, and also has fishing possibilities if you so desire. Day 3: Qashpapampa - Diablo Mudo summit 5350m - Jahuacocha 4070m. Day 5: Jahuacocha – Zambunya pass 4750m - Rondoy 4100m - Llámac – Huaraz. 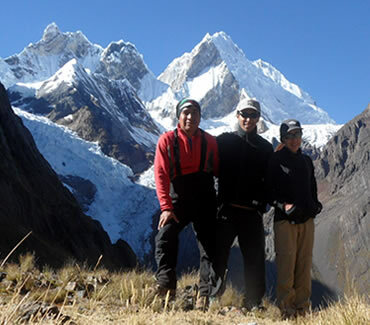 • The day off, you can visit the Rasac and Solteracocha lakes returning in the afternoon to the same campsite. • Bring basic mountaineering gear. See our suggested list. Bring a water bottle with you, in the summer season it can get very hot.